this is a really remarkable wild beer, a blend of different cherry varietals, and while some of the specifics might be lacking, its a much more complete cherry profile, the best of all possible worlds in my opinion, the best of the sweet and the dark and the tart, in a super electric thick red base, pretty beer. i found this one to be considerably drier than most of the other cherry beers, and that helps cast the fruit in a different light. instead of the jammy with the tang, its a fresh off the tree farmers market kind of thing, skins and flesh, juice and pit, really woody and well rounded. in the absence of the sweetness, more funk comes through, bretty more than the others, and longer lasting too, wild all the way, with still some good lactic acidity, but a more diverse yeast complexion. plenty of oak, and seemingly more fruit than the other cherry ones, even the family preserves editions with cherries. one of the best casey beers i have had, surprised others liked the single varietals more, this was a mind bender for me, and next to the danube cherry cut, it was a half step better. did they bottle this one? 750ml cork and caged bottle, served in a tumbler. Pours a darker red body incandescent, almost glowing reddish-pink hue; one finger slightly pink head, good retention. Lots of lacing. As typical for Casey, the body of the beer simply glows with the colour of the added fruit. I'm not sure how these beers attain that kind of colour, but they certainly should pride themselves on such. Smells of rich cherry skin, lighter cherry flesh, medium lemon, mild oak, musty house funk that I've become accustomed to. Flavour follows as well; but more of the cherry flesh comes out along with the lemon. These seem to clash a bit, however. 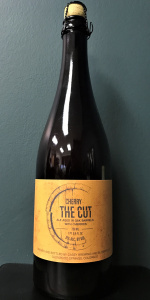 Despite that, this isn't just cherry juice, but the funk adds a bit of complexity to it. Mouthfeel is medium-lighter bodied, crisp, way too easy to drink. Good depth to it. Another solid, beautiful appearing cherry wild from Casey, but as I've noticed, cherry doesn't always work as well as other of the fruits that he uses in his saisons and wilds. This does well, but lags a bit behind his other fruited offerings.